A new development has occurred in France concerning the signing into law of a bill passed by both houses of France’s parliament. The spotlight has shifted to the question of free speech rather than the crime of genocide. At the moment, the most vocal defender of free speech in France appears to be the Turkish Government. This is because Turkey does not want France’s president to sign the “Armenian Genocide Denial bill” into law. One fact which seems to have been lost in the muddied waters of this spectacle is that France already has a Holocaust Denial law on its books. The same Turkish Government who is now France’s newest proponent of free speech in France, does not champion free speech in Turkey. Within Turkey’s borders, the Turkish Government censors the press and the Internet, and criminally prosecutes those who “insult Turkishness” with their words, this includes openly commenting about the Armenian Genocide. While the facts about Turkey’s human and civil rights abuses are well known, Turkey’s aggressive multi-decade, multi-national, multi-million dollar lobbying efforts aimed at blocking Armenian Genocide recognition are less frequently in the headlines. Do we have free speech when an outside government dictates what we can and cannot say under the guise of foreign diplomacy? Questions raised about free speech are fair and essential. However, we must not limit this discussion to the passing of a law in France. Michael Bobelian’s book, Children of Armenia, which is painstakingly documented, illuminates the dark side of genocide denial and illustrates how it is possible to forget (or never learn) about seismic events in modern history. If criminalizing genocide denial is not the answer, how do we combat hate speech and state-sponsored genocide denial? (February 25, 2011) NY, NY–For the 26th year, thousands of Armenian Americans and their supporters will gather in Times Square (43rd St. & Broadway) to commemorate the first genocide of the 20th Century: The Armenian Genocide. To be held on Sunday, May 1, 2011 from 2-4 PM, this historic event will pay tribute to the 1.5 million Armenians who were annihilated by the Young Turk Government of the Ottoman Empire. The Commemoration will also celebrate the survival and spirit of the Armenian people, their rich heritage and global contributions. Presenters will include civic, religious, humanitarian, educational, cultural leaders and performing artists. This event is free and open to the public. Armenian Genocide experts Dennis R. Papazian, PhD, National Grand Commander of Knights of Vartan, Dr. Arthur Kubikian, former Chairman of the Armenian Genocide Commemoration in Times Square (1999 and 2006) and Dr. Raffi A. Hovanessian, active in Armenian affairs and Vice Chair of the Diocesan Council in N.Y., are available for media interviews via phone and in-person. Armenian Genocide Survivors are also available (with translators) to discuss their eyewitness accounts as refugees from the Armenian Genocide. Their painful accounts of the horrendous horrors and mass destruction they witnessed and lived through are critical contributions to world history. Why do the Armenians and supporters commemorate the Armenian Genocide? What is the historical evidence to support the Armenian Genocide? Why is the Turkish government denying the Armenian Genocide and what would be the outcomes if the Turkish government acknowledged the Genocide? What major world historical events have taken place in the 20th and 21st centuries because of the denial of the Armenian Genocide by the Turkish Ottoman Empire and other nations? What are the consequences of countries recognizing the Armenian Genocide? Dennis R. Papazian, PhD, is the National Grand Commander of Knights of Vartan and founding Director of the Armenian Research Center at the University of Michigan-Dearborn, where from 1971-2006, he held the position of Professor of History. He also served four years as Executive Director of the Armenian Assembly of America in Washington, D.C. In addition, Dr. Papazian was on the Board of Trustees of the American Diocese of the Armenian Church (Eastern), Secretary of the Board of Trustees of the St. Nersess Armenian Theological Seminary, President of the Society for Armenian Studies and Editor of the Journal of the Society for Armenian Studies. He is listed in Who’s Who in America and resides in N.J. with his wife, Mary, who is Senior Vice President of Lehman College, CUNY. Arthur H. Kubikian, DDS, is the former Chairman of the Armenian Genocide Commemoration in Times Square (1999 and 2006) and is an active member of the Knights of Vartan. He resides in Long Island, N.Y.
Raffi A. Hovanessian, MD, has been active in Armenian affairs throughout his life and is presently Vice Chair of the Diocesan Council in N.Y. He has served on the boards of the Armenian Assembly, AGBU, St. Nersess Seminary and the American University of Armenia and is an active member of the Knights of Vartan. He resides in N.J. The 96th Commemoration is organized by the Mid-Atlantic chapters of Knights & Daughters of Vartan, a U.S. fraternal organization of Armenian-Americans, and co-sponsored by the Armenian General Benevolent Union, Armenian Assembly of America, Armenian National Committee of America, Armenian Council of America and ADL-Ramgavars. Participating Organizations: Diocese of the Armenian Church, Prelacy of the Armenian Church, Armenian Missionary Association of America, Armenian Catholic Eparchy for US and Canada, Mid-Atlantic ACYOA, AYF, Armenian Youth Organizations, Armenian University and College Clubs. In New York City, the public television network WNET ran genocide-themed programming during the month of April. I saw a program about a man seeking (and finding) ‘righteous’ Moslems who helped Jews survive during World War II. Thanks to WNET, I also finally mustered up the strength to watch the feature film, Hotel Rwanda, based on a the true-life story of Paul Rusesabagina, a hotel manager who housed over a thousand Tutsi refugees during their struggle against the Hutu militia in Rwanda. I highly recommend the film. And, as an Armenian, I wanted to attend the excellent programs commemorating the Armenian Genocide here in New York, including a reading of literature written by several of the Armenian intellectuals arrested by the Turkish Government on April 24, 1915. Most of the Armenian leaders and intellectuals were subsequently murdered and their voices silenced. In fact, this organized act of brutality has been described as ‘decapitating’ the Armenian nation. But, we owe a debt of gratitude to the dedicated staff of the Zohrab Center, who made it possible for the audience to hear the words of our poets, writers, and representatives in parliament come to life again, in the sanctuary of St. Vartan’s Cathedral. I encourage you to learn about the histories of all three genocides and make it your business to know about the genocide being committed in Darfur. Of course, no one wants to look at the dark side of life, but it is important to know about man’s inhumanity to man, so we can recognize the signs and break the cycle of genocide. And, please make your voice heard for all those who can’t speak out. Roughly equivalent to Kristallnacht, April 24th marks the 95th Anniversary of the Armenian Genocide. Many events are planned to commemorate this important date for Armenians all over the world. Lenna Garibian, the granddaughter of an Armenian Genocide survivor, will join individuals who survived the Holocaust, Cambodian and Rwandan genocides at Tufts University’s upcoming program. Ms. Garibian will share her grandmother’s story at the event. 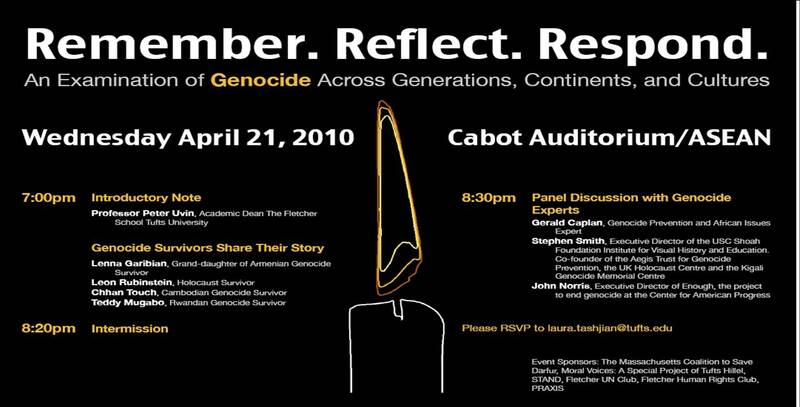 The program also includes a panel discussion among genocide experts. The segment will feature an interview with Professor Peter Balakian, author of Black Dog of Fate and The Burning Tigris, and co-translator/editor of Armenian Golgotha. Reporting the story is senior correspondent Bob Simon, whose recent 60 Minutes work includes a segment on the Greek Orthodox Ecumenical Patriarch of Constantinople.